On the first day of President Barack Obama’s program to extend some measure of legal protection to undocumented youth, Gov. 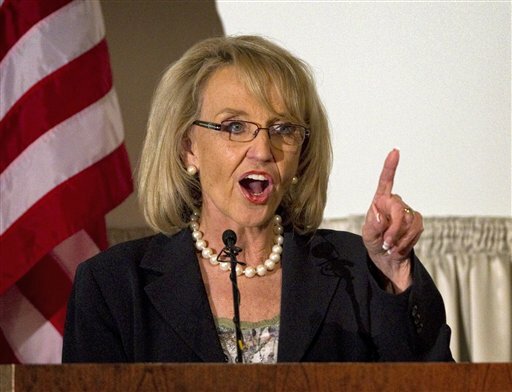 Jan Brewer of Arizona signed an executive order that denies them any benefits in her state. It’s just one more mean and spiteful move by Brewer. She’s getting the predictable accolades from far right wackos but it&apos;s another short-term move with long-term negative effects for Republicans among the country’s fastest growing population: Latinos. What will Brewer’s executive order actually do? Its most immediate effect will be to refuse to grant driver’s licenses to DREAMers or offer in-state college tuition. But because Brewer’s order actually denies recognition based on federal work permits that Arizona was recognizing until she put pen to paper on this odious order, she will also be denying future driver’s licenses and other benefits to perfectly legal foreign workers who have nothing to do with Obama’s deferment program. In other words, Brewer’s order is designed more to mess with the president at the expense of immigrants than to actually do anything about those immigrants. How short-range is this? Well, consider this: While Arizona’s population is about 58 white (not Hispanic) and about 30 percent Latino, those numbers represent nearly 2 million Hispanics — a 46 percent increase from ten years ago. Latinos leapfrogged from four percent of Arizona’s population in 2000 to 25 percent in 2010. Right now, more than 22 percent of all American children under 18 are Latinos. A full 52 percent of those are U.S. born. A whole chunk of those live in Arizona. And when they gear up to vote, in say, 2020, just about when they&apos;re an inevitable majority, how do you think Republicans are gonna fare?